You may not know the name Alan Sterling. But if you’ve ever driven toward Compo Beach in the winter, you know his boat. Alan built it out of wood, himself. He named it “Gloria” — for an old girlfriend — and he took it oystering. He once leased 150 acres of oyster beds, between Compo Beach and Cockenoe Island, from the state. It was a tough job, but Alan — a Staples grad — loved it from the day he began, in 1964. In recent years though, poachers took quite a bit of joy — and millions of oysters — from him. Alan Sterling culls his oysters. In the winter, Alan moored “Gloria” — named for an old girlfriend — in Gray’s Creek, between Compo Beach Road and the Longshore exit. Some winters, he lived on the boat. It was cold, but it was home. This year, Alan spent a lot of time fixing up “Gloria.” He finished the repairs in early July, and was ready to go out for another season. On July 4, Alan had a massive heart attack as he was leaving the VA Hospital in West Haven. He died right there. I did not know Alan well. But I knew the boat, and I knew how passionate he was about oysters. If only he could have gone out to his beloved beds, one more time. 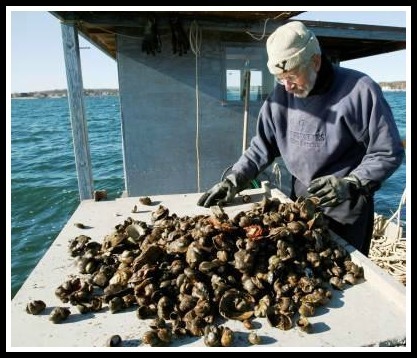 This entry was posted in Beach, People and tagged Alan Sterling, oyster beds. Bookmark the permalink. I knew Alan in the 1960’s when he worked on the research boat for Bolt Associates in Norwalk. He was a great guy. I am saddened to hear of Alan’s passing. His boat was often moored behind our house on Grey’s Creek. We always knew when a big storm was coming by the arrival of his boat. . My husband met Alan a few days after a small storm had tipped his boat on its side. My husband offered to call or email Alan the next time the boat tipped over or broke its mooring. Alan said “Thanks for the offer but I don’t have a cell phone or e-mail.” He was old school Westport, hardworking and independent. We will miss him and his boat Gloria. Very sad news. Alan was a gentle soul and one of Westport’s few remaining genuine and independent characters. The big boat poachers were the bain of his existence and eventually forced it from him. I will miss seeing him around town. From what I know of him and how much he loved and missed Gloria, he is resting in peace. Also, his last few years were made much, much more comfortable because of the efforts of Skip Lane and Dan Woog both of which helped generate helpful public understanding of Al’s indie-oysterman difficulties. Their support really enabled him to enjoy these last years in a greater level of comfort than he otherwise would have. Hmmmm….I’ll let this one stay! Alan was a true Good Samaritan… He always had the tools to help someone out of a jam (i.e. me with bald tires in a snowstorm). You don’t get many of these folks, and it’s a sad loss when one goes. Good for you, Dan (and Skip), for helping Mr. Sterling out. I did not know him, though I wish I had. I would, though, love, love, love to see more photos if any are available. Great story, Dan. Sorry for everyone’s loss. Oh, how sad am I to lean of his passing…and just after fixing up his boat but before being able to get out there again. I knew him; he was quite a character! Mr Sterling was really into photography. We would talk for hours about everything. What a great guy, I am really going to miss him. I have known Alan since the Players Tavern days and been friends with him since I was 19. I was devastated to hear he died. I only heard last night. I did see him out on the water with two friends a couple of weeks ago when I was kayaking, so he did get out. I don’t know if this will help you find Alan’s brother, but The last time I spoke with him, and that was a few years ago, his brother was in New Canaan/Silvermine area. That is also where their parents are interred. The Oysterman is gone and I am very sad. For many years Alan and I talked almost weekly. He was hard working, gentle, simple but also very complex. He was a most unique old time Westporter. I loved him. He was a very beautiful man – one of a kind. I will miss him and his oysters. I came to Westport in Jan. 1967 as an au pair from Denmark, and I lived in Westport until late 1968. Alan was on of the first people I met, he quickly became a good and trusted friend. I was very young (22) and somewhat immature, my English that first summer was not great, and many American customs were confusing to me. Alan was patient, encouraging and supportive, almost like the big brother I never had. Later I met his brother Doug and he became a friend as well, but not in the same way. After I moved to New York City in 1969 I would often visit Westport and I stayed in contact with Alan, but after eventually we lost contact with each other. So sad to learn of his passing I often wondered what happened to him, I’m not surprised he never left Westport, nor am I surprised of all the good things people have to say about him. I cherish all my memories from Westport and the friends I made there, some I’m still in contact with such as: Val Treadwell a 1963 Staples graduate, others on a less frequent basis, Steve Gjuresko and Jeff Simon (1964 Staples graduate). I was very lucky to come to Westport and lucky to have Alan as a friend, even for a few short years.